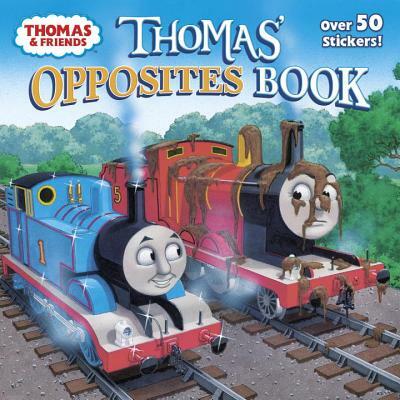 Learn about opposites with Thomas & Friends! Thomas the Tank Engine and his friends Percy, James, Cranky the Crane, Harold the Helicopter, Edward, Gordon, and many others help train-loving boys and girls ages 3 to 6 learn all about opposites in this paperback storybook with stickers! In the early 1940s, a loving father crafted a small blue wooden train engine for his son, Christopher. The stories that this father, the Reverend W Awdry, made up to accompany the wonderful toy were first published in 1945 and became the basis for the Railway Series, a collection of books about Thomas the Tank Engine and his friends—and the rest is history. Thomas & Friends now make up a big extended family of engines and others on the Island of Sodor. They appear not only in books but also in television shows and movies and as a wide variety of beautifully made toys. The adventures of Thomas and his friends, which are always, ultimately, about friendship, have delighted generations of train-loving boys and girls for more than 70 years and will continue to do so for generations to come. Christy Webster edits and writes books for kids as part of her job in the editorial department of a major New York children's book publisher. She is a big fan of popular culture and has a great eye for quirky illustration styles. Among her titles are A is for Awful: A Grumpy Cat ABC Book, Big Fish, Little Fish, and I Can Be a Ballerina. She lives in Queens, New York. Richard Courtney is a published illustrator known for his colorful work in the children’s book series Thomas & Friends.